-Wearing this thing on a shirt screeeams that you're a tourist, not something you want everyone to know. You're suddenly a target for both haggling merchants and shadier elements that are best kept uninformed. The first change I'd make is to transfer this whole pattern to a small, pocketable card. Unless you're the urban-hip-geek-chic type who wants to wear this kind of thing anyway. -The question mark goes without saying. I guess it centralizes and emphasizes your cluelessness (a good thing? ), but pointing to a symbol will already prompt a passerby to give you directions, no question mark needed. -The number pad ain't easy. Presumably this is for price haggling, but trying to communicate a long number one digit at a time can get hairy when there's already a language barrier in the way. In street markets which frequently cater to foreign travelers, merchants usually use a basic calculator to simply display numbers when asked about prices. Since we're moving this whole product from a shirt to a card anyway, including a small solar calculator--or just an LCD number display, no calculating functions needed--would be a no-brainer. -The instructions. 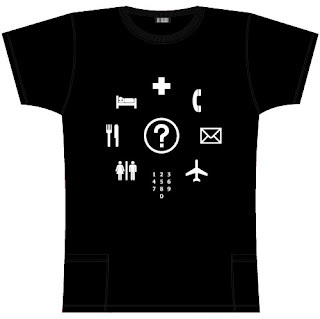 The product page says: "Point a finger at the pictogram you need and then point it twice at the question mark, which means, 'Where is it?'" It's a good goal to design products so intuitively that they don't need instructions - and this is especially true where language barriers are involved. I think this product is already intuitive enough that those instructions aren't needed, and to boot, they're ridiculous - those on the receiving end of the use of this product won't have read them! -Sexual harassment. This shirt is available in women's styles. Think about it. Okay, it took me a minute to realize that this shirt is actually meant to be worn by tourists. At first I thought it was a joke. In fact, if I saw someone wearing it, and trying to use it, I would laugh. And as a woman who's traveled in South America, there's NO WAY I would use that shirt. I agree...I really would laugh too but mostly because this shirt is really funny and clever. It is also a good excuse to start a conversation with a nice scandinaviam girl. Hey, Rafael's got the right idea! If this thing is a conversation piece, then it's a whole different beast - not really a usability issue at all! This "review" is what I call, "not getting to the point". As other said, the all point is the fun of it. It's an excuse to start a conversation.